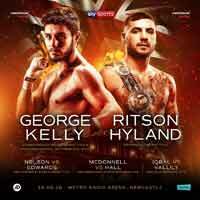 Review by AllTheBestFights.com: 2018-06-16, some good single shots between Josh Kelly and Kris George but it is not enough to get three stars: it gets two. The undefeated former olympian Josh Kelly entered this fight with a perfect boxing record of 6-0-0 (4 knockouts) and he is ranked as the No.38 welterweight in the world. In his last three bouts he has won over Jose Luis Zuniga, Jean Michel Hamilcaro and Carlos Molina (Josh Kelly vs Carlos Molina). His opponent, Kris George, has an official record of 14-1-0 (8 knockouts) and he entered as the No.42 in the same weight class. He suffered his only loss when he face Can Xu in 2015, since then he has won seven consecutive bouts defeating Maximiliano Leonel Scalzone in 2018. Kelly vs George is valid for the Commonwealth (British Empire) and WBA International welterweight titles. Watch the video and rate this fight!